Easy push button programming allows preheating of glow plugs, range of low fuel shutdown, and service schedule. Monitors, protects, and controls engine and generator operations with automatic warning and shutdown features. Oversized generator provides maximum power for single motor starting kVA and longer bearing and insulation life. Voltage selector switch allows power to lugs to be set in single phase or various three phase settings and incorporates padlockable switch for safety. Heavy duty sound attenuated aluminum enclosure with stainless steel hardware provides quiet operation, 68 dBA at 23 feet, and rust-free weather protection. Padlockable cabinet doors and fuel cap offer protection against unauthorized entry. 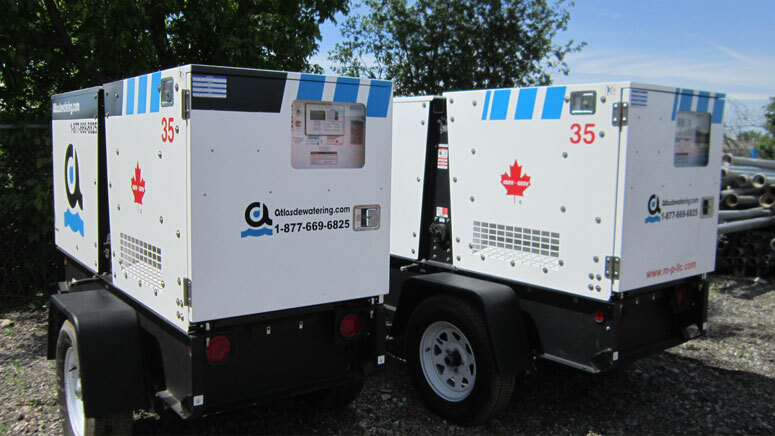 Atlas power generators team up conveniently with all Godwin electric powered equipment and Flygt electric submersibles. Reliable. Rugged. Ready. Atlas Lights — a series of portable light towers engineered to meet an array of illumination needs. Atlas Lights are powerful enough to cover 5 to 7 acres, yet portable enough to be manned by one person. And no matter where you are or what your application is, our unprecedented service is just a phone call away.